The picturesque upper part of the river Uh, in Transcarpathia. 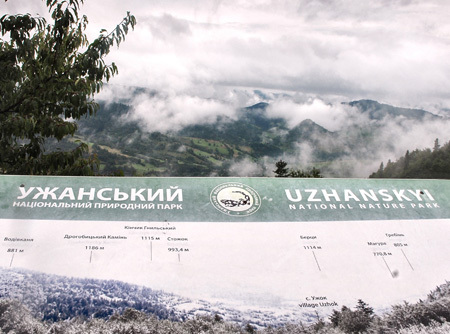 Here near the border with Poland and Slovakia, stretches Uzhansky National Natural Park. Established in 1999 on the base of the regional park “Stuzhytsya”, Uzhanskyi National Park is an integral part of the world's first trilateral Ukrainian-Polish-Slovak Biosphere Reserve “Eastern Carpathians” which are included in the World Network of Biosphere Reserves by UNESCO. Area of the park is 39 159.3 hectares, of which 14 904.6 are granted to it for permanent use. The park is a member of the European Federation of protected areas “Europark”. In the park grows about 900 species of higher vascular plants, 300 lichens, 143 mosses, 58 fungi types and 164 species of algae. In Red List of Zakarpattya are recorded 31 species of vascular plants. 52 species of higher plants, 5 species of algae and 21 species of lichens are included in the Red Book of Ukraine, the four - International Red List. In the territory of park are found 519 species, of which 65 are listed in the Red Book of Ukraine, 27 species are listed in the European Red List. In July 2007, 6.1 thousand Ha (including 2.5 thousand Ha - warren core) of beech forests were included in the UNESCO World Natural Heritage “Primeval Beech Forests of the Carpathians”. Uzhanskyi National Park has a strong recreational and tourist potential which is used throughout the year. On its territory there are many interesting natural objects. Recently actively is developing rural tourism, taking steps to open cross-border pedestrian crossings with Poland and Slovakia, restored 17 long hiking trails created 7 ecological paths, organized a number of new ones. 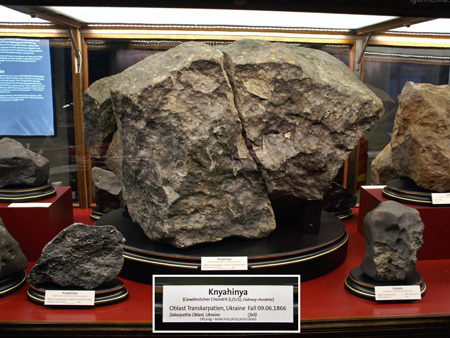 June 9, 1866 at 17.00 in the village Knjahinya of Velykobereznyansky Transcarpathian region has fallen meteorite (LL5 stone chondrules normal), called “Knjahinya”. This meteorite has not reached the Earth crumbled into small pieces in a large area. After the fall were collected about thousands of parts with a total weight of about 500 kg, which went to many, mainly foreign museums. The largest piece weighing 279 kg found in the natural Black Mlake, to which is now titled ecological route is laid. The main part now is kept at the Vienna Museum of Natural History (Natural History Museum in Vienna). 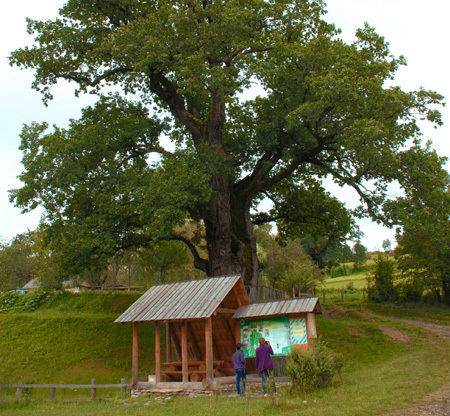 “Dido-Oak” Oak and ”Champion” oak in the village Stuzhytsya attract attention of many tourists. These oaks are the oldest and largest oaks in Ukraine. The circumference of the trunk Oak “Champion” is 9.6 meters, height - 25 meters, and the age of the giant experts estimated at 1300 years. 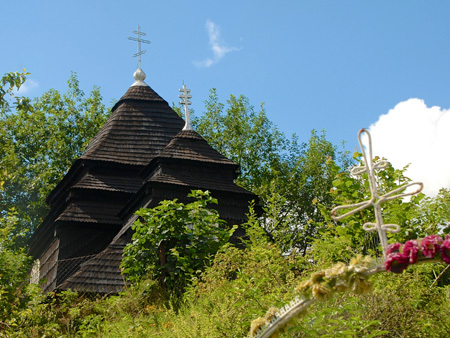 Transcarpathia architectural monuments - wooden churches in Boykies and Lemkies style, built in XVII - XVIII centuries. First of all, it is the Church of the Holy Virgin (1645) in the village Kostryno, St. John the Baptist (1679) in the village Suhiy, St. Archangel Michael (1745) in the village. Uzhok, St. Basil the Great (1703) In the village Sil, St. Nicholas (1655) in the village Gusnyi, St. Archangel Michael (1700) in the village TowerVishka and Church of the XVIII century in the village Domashyno, built in the style of Zakarpattia wooden churches with Baroque elements. 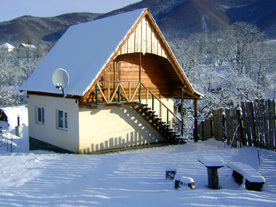 Located on the border of Galicia and Transcarpathia at an altitude of 852 m above sea level. p. m., on the watershed basins of the Vistula, Danube and Dniester, near the border with Poland. It offers an unrivaled panorama of meadows Ravka, 1269 m (Eastern Beskids) and g Ostra, 1408 m (mountain valley Carpathians). Uzhotskyy Pass is important not only for the trunk road, but also for rail transport. 14 railway tunnels are laid here. 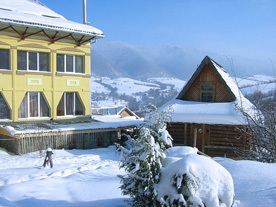 Resort is located in a picturesque area in the middle of the mountains Krasiya, landing near the cableropeway point No1. Rest will satisfy the most demanding requirements of the guests, and the kitchen will surprise the taste and quality of fine European and Transcarpathian dishes even gourmet. The manor “Tscherbin” is located in the National Park, near the villages Uzhok and Volosyanka, along with beech forest. 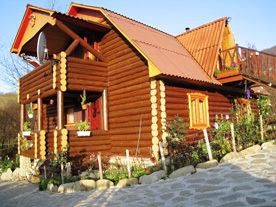 Distance from Uzhgorod - 80 km., from the train station - 200 m. The mistress of the estate prepares delicious homemade dishes from natural products. 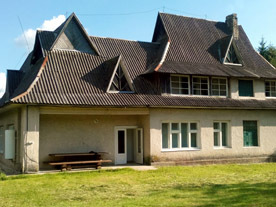 Health center “Uzhansky kupeli” is surrounded by the Carpathian Mountains in the village Uzhok, Velykobereznyansky district, Transcarpathian region. Delicious home cooking, large portions at a reasonable price, nice atmosphere and relax. 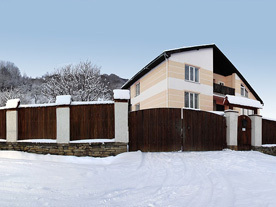 Private estate “Liskovets” is a picturesque place in the Carpathian Mountains for families, located in the valley of the mountain river Uh, 35 km from Uzhgorod, near the village of Malyi Bereznyj. Manor “In Uncle Vanya” - it is a pleasant holiday in a comfortable and well-equipped house, located in the foot of Krasiya (1036m). 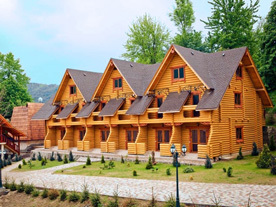 Facility is located in the village Stuzhytsya of Velykobereznyansky District in the territory of Novostuzhytskiy environmental research department Uzhanskyi National Park, among beech forests. June 9, 1866 meteorite "Princess" “Knjahinya” appeared as fireball over the city Lyptovskyy Mikulash, flying eastwards over the cities Sharish, Zemplin, Presov (Slovakia) and covered the distance over 200 km exploded near the village. Knjahinya at an altitude of 40 km flied apart on a thousand pieces, small pieces of which were the outside of the meteorite, and his two great education - the inner core. Overall fell to 1,200 stones. The largest fragment was found 8 km. Princess of village on the hillside wall (1078 m.) on the meadow “Black Mlaka” (700-800 m above sea level) by peasant Basil Kryv'yanyk. On the discovery ranger learned from the Great Berezno Anton Pokorna, which, he said, for “a couple of oxen, which he chose for himself” Basil Kryv'yanyk bought and resold purchased meteorite Imperial Museum in Vienna. This particular piece is kept to this day and is the pride of the Vienna Natural History Museum. Currently, place a meteorite mentioned in tourist guides, and geographically it is part Uzhanskyi National Park. In 2007, the historic site meteorite included even among the contenders for the “Seven Wonders of Transcarpathia”. And it is here, at the crash site of Europe's largest meteorite "Princess", visited in 1892, the famous French writer Jules Verne. Karst caves near the village Knjahinya emerged through a slow and steady activity of soil and water pidzemyh. Rain and melt water in which a large number of dissolved carbon dioxide, and which therefore can act as a weak acid to seep through the ground and encounter a layer of rock that is highly soluble, such as soft limestone. After a while, when the soil is formed cavity. But water continues to look for a way out. Bypassing insoluble (sandstones) and waterproof rock, it cracks and breaks a mine where maybe and goes underground. Goals are passing, and formed deep underground complex maze of winding corridors filled with water. Wet dripping cave walls and fills the underground galleries, is a saturated solution of various minerals. When changing temperature or pressure, from a solution of calcium particles begin to stand out from other chemical additives. They settle on the walls. Around each droplets that breaks down from the ceiling of the cave, formed by tiny calcite ring. Layering each other, they build interesting formation, which eventually transforms to the massive rounded icicles hanging from the ceiling - stalactites. Towards them from the floor of the cave rising calcite columns - stalagmites, as drops of water, slipping the tip of stalactites and slop on the floor, leaving behind some solid particles. Sometimes the stalactites and stalagmites grow, and then underground “palaces” majestic columns appear. - Organization of massive ecological and educational activities etc. Uzhanskyi National Park is working on environmental education, recreation, eco-tourism in certain thematic routes and ecological paths, provides educational work in schools within its territory. Increased environmental culture level, environmental awareness, health establishments of tourists is carried out through the media, print edition of printed products and didactic material. Recreational activities are aimed at creating conditions for tourism development. For a number of equipped vacation spots developed 17 environmental and cognitive routes, increased provision of recreational services. Environmental actions are regularly held with students of local schools, takes part in environmental exhibitions.